…how come it rates only 30th in Education in the 2013 Legatum Profile of 140 countries? Top of the class is New Zealand that has 14.5 (vs UK’s 17.5) pupils per teacher, 3.1 (1.5) secondary and 1.5 (0.7) tertiary education index per worker. Scandinavia does particularly well with Norway 4th, Finland 6th, Sweden 14th, Denmark 18th and even Ireland a very respectable 11th. …how come it rates 22nd in Safety & Security in the 2013 Legatum Profile of 140 countries? Hong Kong and Iceland vie for the top spot, with only 1.9% of their people having suffered assault in the last two years (vs 2.7% in UK). Indices for group grievance is 1.0 (4.7); for refugees & IDPs 1.5 (3.0); and for demographic instability 1.9 (2.8). 84.6% (vs UK’s 76.4%) feel safe walking home alone at night. Scandinavia’s placings? 3,4,6 & 8 with Ireland at 5. …how come it rates 19th in Health in the 2013 Legatum Profile of 140 countries? For a country that invented and values the NHS, it must be embarrassing for the UK that tiny Luxembourg comes top. They have 5.4 hospital beds per person (UK is 3.0), 99% (88%) are immunised against infectious diseases and only 25% (31.1%) felt worried by something. Scandinavia came in at 5,12,14 & 16 with Ireland on 15 and much-derided Iceland at 13. …how come such a bastion of freedom and home to the mother of Parliaments only rates 13th in Personal Freedoms? All Scandinavian countries (bar Finland at 17th) rate higher, as do Iceland (6th) and Ireland (8th). Hell, even Costa Rica beats the UK in 11th place. …why would such a land of bucolic villages, ruddy-cheeked yeomen and the fly cuppa, of the BBC, deference to Her Maj and friendly bobbies only place 12th in Social Capital? Don’t tell me those horned-headed reformed pillagers are beating us at that too? ‘Fraid so: they place 1,3,7 & 10; Ireland and Iceland bracket us in 11th & 13th places. …it must rank near the top by some global measure, surely? 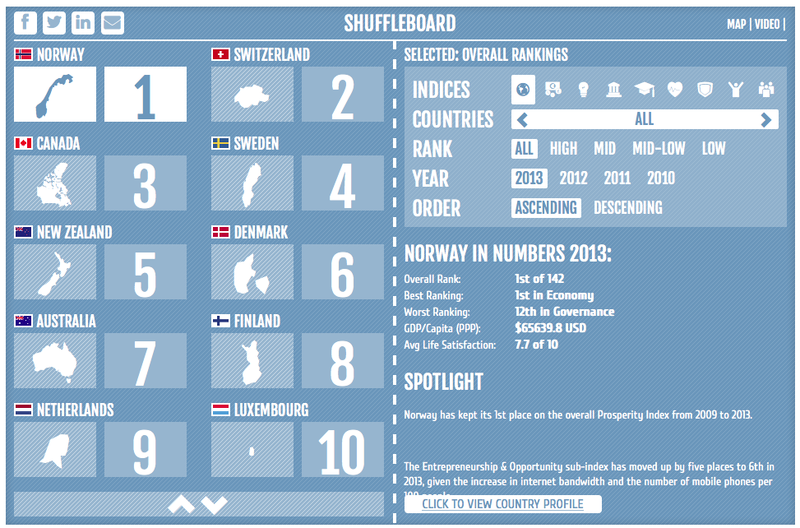 Well the closest it comes are in Governance and Entrepreneurship, where it rates 9th place in both cases.In the former it lags Denmark (3rd—maybe Borgen wasn’t just fiction) and Finland (5th) but does beat Norway (12), Ireland (14) and Iceland (18). But in the latter, Scandinavians take 1,2,3 & 6 with Iceland at 7 and only Ireland behind at 14. …then this, the world’s 6th-biggest economy, must be to the fore when it come to leading Western civilization out of the worst recession since the Crash of ’29? Errr, nope. This is where it gets really embarrassing for Osbo—the UK languishes in 28th place, beaten not only by the six countries compared above but by a smorgasbord of comers many Brits might have trouble placing on a map (see education above). These include Malaysia, Kuwait, Thailand and Mexico.In this year of much-touted 0.8% growth in the UK economy, it actually dropped three places. Those in Scotland who genuinely believe that we would be better off linked to England need to knuckle down and explain their case in the face of such statistics. Five of those countries started off as colonies of another on the list and are doing very nicely, thenk you very much. Better Together has no credibility until it explains why Scotland should be so uniquely different that the story of their respective roads to superior prosperity—which includes superior quality of life—cannot apply to us. This entry was posted in Commerce, Politics and tagged economic comparison; Legatum; index of prosperity. Bookmark the permalink.